Play only if it is not Day. Action: Put a [Miskatonic] character with at least 1 (A) icon into play from your hand. At the end of the phase, return that character to your hand if it is still in play. The arcane restriction isn't much at all. Returning to hand isn't bad either as many Misk cards give benefits on entering play. The not day restriction is OK too, Misk likes day but generally its not essential I think this card has a lot going for it, having another Ultima Thule in the deck can't be a bad thing. An easy enough include if Misk is a second faction in a deck too, given its not loyal. The "not Day" restriction isn't really a problem, since most people want it to be Night anyway. The actual effect is card disadvantage on the surface, but it gets better when you're using it to play something like Jeremiah Kirby. I'd rather just use Ultima Thule and build around that, but if I really need two of the effects in a turn or something, then Night Class is the way to go. 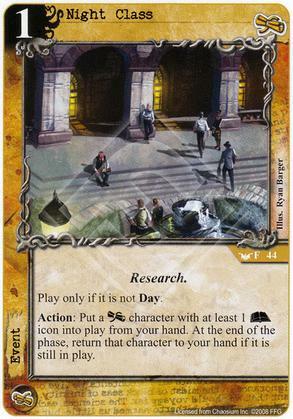 Using this to get a 1st turn anthropology advisor could get MU off to a great start, it's also another way to Matthew Alexander into play if you wanted to ambush in 2 characters at once. MU have a lot of come into play abilities on arcane characters, a lot of them give card advantage which negates the disadvantage from playing this card. A good play would be board of directors to tutor a location into play.